Another gorgeous way to end a day. I drove back to Las Vegas from Valley of Fire State Park alongside Lake Mead. Lake Mead is the reservoir formed by Hoover Dam. 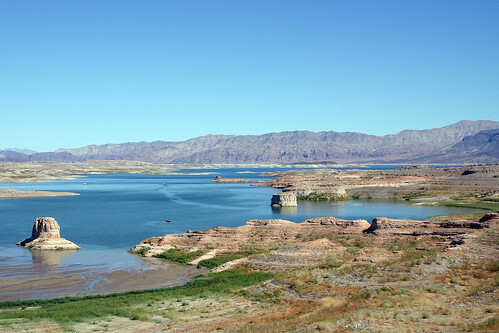 It took three years for the Colorado River to fill up the lake. If you poured out the volume of water the lake can hold at its maximum capacity, it would cover an area the size of Pennsylvania to a depth of one foot. That’s a lot of water! This entry was posted on March 16, 2008 at 8:26 pm and filed under desert, lake, Lake Mead, Lake Mead National Recreation Area, Las Vegas, Nevada, reservoir, vacation, water.